SECOND SLICE: DO YOU THUMP YOUR WATERMELON? - What About Watermelon? You are here: Home / General / SECOND SLICE: DO YOU THUMP YOUR WATERMELON? SECOND SLICE: DO YOU THUMP YOUR WATERMELON? Some people thump their watermelons and some people don’t. (For the record, I don’t.) But it’s an interesting topic, so I’ve decided to give this 2012 blog entry another look. Leave a comment with your thoughts on thumping and don’t forget to sound off in the poll on the right. I’ve written in the past about how to choose the best watermelon using the three-step “Look, Lift, and Turn” test. In that blog entry, I also mentioned that tapping or thumping a watermelon to determine ripeness isn’t the most reliable tactic. But that hasn’t stopped millions of people from drumming on watermelons in the grocery store. 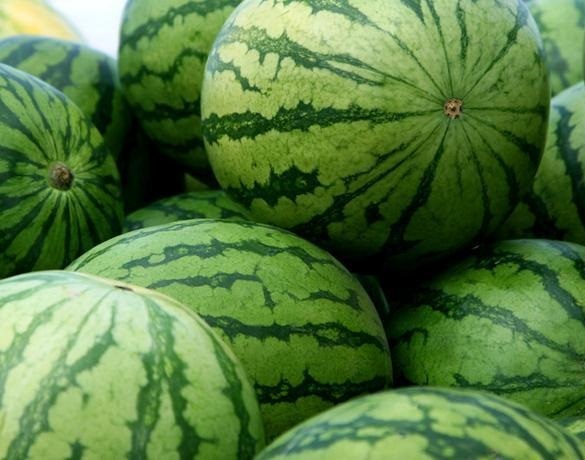 There’s even a smartphone app that will analyze the sound of a watermelon thump and let you know if the fruit is ripe or not (look for a test and review of the app here on the blog later this month). Even though the sound test isn’t a scientifically proven ripeness detector, many people (myself occasionally included) still give their watermelon a good knock before placing it in the cart. Which brings me to this month’s poll: Do you thump your watermelon? Let me know by answering the survey on the right and offer your opinion of this method with a comment below. SECOND SLICE: IS IT OKAY TO FREEZE WATERMELON? SECOND SLICE: WHAT ARE YOU DROPPING ON NEW YEAR’S EVE? No I don’t thump. I just pick one and pray I made the right choice. Ah…my method…pick up a few of the same size to see the weight, studying skin for any marks that occurred after harvest, then hope for the best. Pick and pray…that’s pretty much what I do too Ellen! Debi has a good method too. I guess I do a combo of “pick and pray” and Debi’s “inspect and analyze” method. I use my Dad’s method, I smell the root end, feel the heaviness, give the stem end a gentle nudge for a slightly soft feel, if it smells like a melon , it’s probably getting ready…same with most fruit and melons. I don’t thump! I like your dad’s method, Paula…the “Sniff Method.” I might have to give that a try! I’ll try to choose the heaviest melon! I then possibly will thump the melon just because I can! They even have an app that is ‘supposed’ to tell you if your melon is ripe – fun to have! Regularly use this method–and for the record have maybe had one in all the times I’ve done it to not be a deliciously sweet and ripe melon! It works!